Boasts? Who, it should be noted, are advocates for nuclear power? Why the derogatory remark regarding the paper suggesting that 100% renewables studies all fail a set of viability checks? And why the added warning that the authors are advocates of using nuclear in future low carbon grids? Where are the warnings that the authors of the100% renewable studies are antinuclear? Dave also appears to be unaware that the other study he mentions is also authored by advocates for nuclear power. 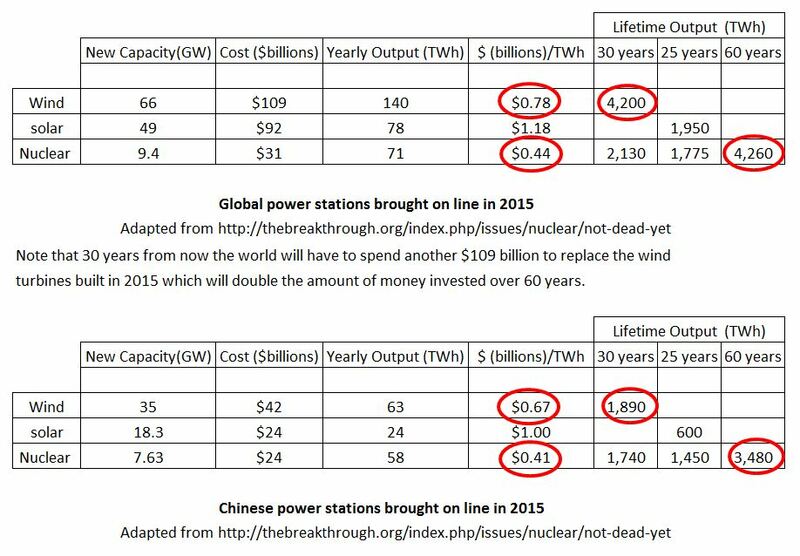 Jesse Jenkins was banned from Mark Jacobson’s (the 100% renewables guru) Twitter feed for pointing out that Jacobson’s own data shows that using nuclear in the mix would greatly reduce costs. “Ancillary services” are things like frequency regulation and voltage control, which keep the grid stable and have typically been supplied by fossil fuel power plants. It's mostly supplied by fossil fuels only because most generators are spun by them. Any energy source that spins a generator (synchronous machine) supplies frequency regulation, be it solar thermal, hydro, geothermal, or nuclear. Having no background in engineering or science, I seriously doubt that Dave understands what an alternating current is. I doubt that Dave understands sine waves, a concept taught at the introductory level of any engineering school. The frequency of the voltage produced is synchronized with the rotational speed of the generator (ns = 120fe/p). Click here to watch a rotating object scribe an sinusoidal curve. Want more? Click here. Bottom line, regulating frequency on a grid without rotating generators (synchronous machines) is much, much, easier said than done. It gets expensive, progressively more so as decarbonization reaches 80 percent and above. Trying to squeeze out that last bit [above 80%] of carbon without recourse to big dispatchable power plants is extremely challenging, at least for today’s models. David just suggested that most studies are showing we can get to 80% renewables without “big” dispatchable power plants, that only the amount above 80% needs the CCS canard and dispatchable power. 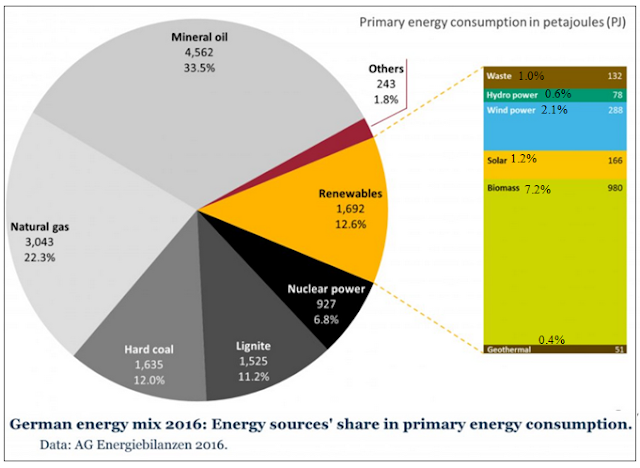 Look at Figure 1 from a 2017 study by the IEA and IRENA commissioned by the German government. 80% of the energy is coming from “big” dispatchable power plants. And note that there is no CCS. 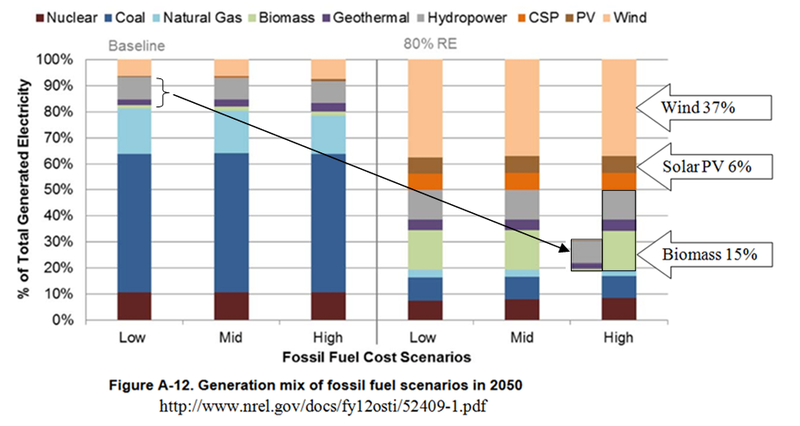 And look, another one (see Figure 2), this time from the NREL, (which did not allow nuclear to expand) where over half of the 80% of electricity is coming from dispatchable sources. The IRENA (International Renewable Energy Agency) results (which held nuclear constant and subsequently increased costs by a full third) also do not use CCS, and note that almost half of the energy is still coming from ”big” dispatchable power plants. See Figure 3 below. I edited the above comment for accuracy. We have many studies and a few real world test cases. All of these studies have radically different “theoretical” pathways to decarbonize, which indicates that their theoretical findings are the result of their chosen input assumptions. Garbage in = garbage out. These studies are based on literally hundreds if not thousands of assumptions (educated guesses). The bias enters the study via the researcher’s choices among the many assumptions to choose from. The real world tests like Germany are producing dismal results. Consumer electricity rates are some of the highest in Europe and climbing. German emissions have been flat for about the last six or seven years and actually increased last year. I wouldn’t say that there are “several” such studies and below in Figure 4 is a chart derived from data published by the NREL to give you a feel for the feasibility of a continental high-voltage super grid. Above, Dave appears to be making the argument that maybe the criteria in place for all power grids today is setting the bar a little too high for a 100% renewable energy grid. If any new system must demonstrate in advance that it is fully prepared to substitute for today’s system, it’s going to be difficult to change the system at all. Of course they have to demonstrate ability in advance, just like any new airliner has to. You can’t deploy trillions of dollars of wind and solar and then find out it won’t cut the mustard. The German experiment is fizzling. The El Hierro 100% power from wind pumped hydro experiment has failed. There is no real world evidence that renewables can carry the load alone. Renewables advocates might say that nuclear advocates have a vested interest in keeping feasibility criteria as strict and tied to current systems as possible. Renewables advocates might say that nuclear advocates have a vested interest? Above we catch Dave inserting into the internet echo chamber yet another antinuclear conspiracy theory which will eventually make the rounds in comment fields. Keep your eye out for it. Which models? Jacobson’s ridiculous 100% renewable model or the ones showing that the inclusion of nuclear reduces costs? Less nuclear = more hydro and biomass (two sources reviled by most environmental groups because they are so environmentally destructive). It pays to be careful with literature reviews. They are generally more reliable than single studies, but they are exercises in interpretation, colored by the assumptions of their authors. Really, Dave? Given the choice between a statistically insignificant sample size of unsubstantiated, biased, personal opinions from so called “energy experts” …and literature review of published studies, you would go with the unsubstantiated opinions, I’m assuming, because they favor renewable energy? And there’s always a danger that they are simply compiling common biases and limitations in current models — reifying conventional wisdom. 100% renewables studies are not compiling common renewable energy biases? All of these studies strive to minimize fossil fuel use. What do you suppose Dave means by environmental impacts? The impact on river ecosystems by hydro, the impact on ecosystems by biomass and biofuels, or the impact on birds and bats by Jacobson’s 100% WWS plan (see Figure 5 below)? Certainly, replacing part or all of those with nuclear would lessen those impacts. Community control? What does that even mean and how is that a benefit? Dave doesn’t want “the man” to be in control of his water, sewer, garbage, and electric utilities? Security? I have no idea what he’s talking about here, and have to wonder if he does. Independence? Is he parroting the old energy independence argument about oil imports used to get 10% (ostensibly) renewable corn ethanol into our gas tanks and create a permanent back-door subsidy for corn farmers? Is he calling for America to cut off all imports, cars, computers, smart phones, food, and on and on, in the name of independence? …the ideal analysis of deep decarbonization would involve a full cost-benefit analysis, taking all effects, “the full range of climate impacts (not just CO2), air-quality benefits, water-quality benefits, habitat destruction, energy security — everything you can think of,” into account. No one, he said, has done that for getting above, say, 90 percent WWS. …full cost-benefit analysis is likely to offset higher renewables costs [and of course he failed to mention that the same would be true for nuclear costs] more than most models show. Again, Dave is thinking that these benefits would all arise only from the use of renewable energy. Clearly, when it comes to habitat destruction, hydro and biomass take the cake and Jacobson’s plan would likely make wind into a very major source of bird and bat mortality. When it comes to air-quality benefits, nuclear is the equal of wind and solar. Energy security is a canard, a lever used by politicians since the 1974 oil embargo to fund pork barrel biofuels projects. If electrification of transport will end the use of oil, then clearly nuclear can help do that. “My own view,” he told me, “which is informed but not demonstrated by my work on 100% WWS, is that the very large environmental benefits of WWS probably make it worth paying for close to — but not quite — a 100% WWS systems. Assuming there is any validity in that, the very large environmental benefits of nuclear would make it worth paying for as well. They didn’t mean to do it, but their health and environment argument promotes the use of nuclear more than it does renewables. Most models are based on current markets, which will change. Will they? Got proof of that? And if they don’t, what then, nuclear? “Our traditional energy models are pretty clearly biased against a 100% renewable outcome,” Noah Kaufman told me. Renewable energy studies excluding nuclear are not clearly biased against nuclear? VRE is already screwing up wholesale markets, even at relatively low penetrations, because the incremental cost of another MW of wind when the wind is blowing is $0, which undercuts all competitors. Dave actually managed to make this sound like a good thing; wind and solar are so cheap they are undercutting fossil fuels and nuclear. A translation is in order. I call this the intermittent power glut effect. When wind and solar produce way more power than is needed at any given time of day, you get a supply and demand imbalance and we all know from Econ 101 what happens when supply greatly outstrips demand. Prices paid for electricity to power companies by the grid operator tank. Given time, this can lead to fiscal insolvency of the power stations needed on the grid to take over when wind and solar are not available or are inadequate. To prevent their bankruptcy, regulators then need to subsidize those other power companies. The money for that comes from either rate payers or tax payers and an upward cost spiral ensues. This is why German electric rates continue to go up. Dave then fails to link to his own article at this juncture where he suggested that it would be remarkable if wind and solar could someday hit 60% because of the intermittent power glut effect. His article was based on an article by Jesse Jenkins who pointed out, as a rough rule of thumb, that wind and solar penetrations are likely limited to roughly their capacity factors (approx 35 and 15 percent respectively) from the intermittent power glut effect alone. 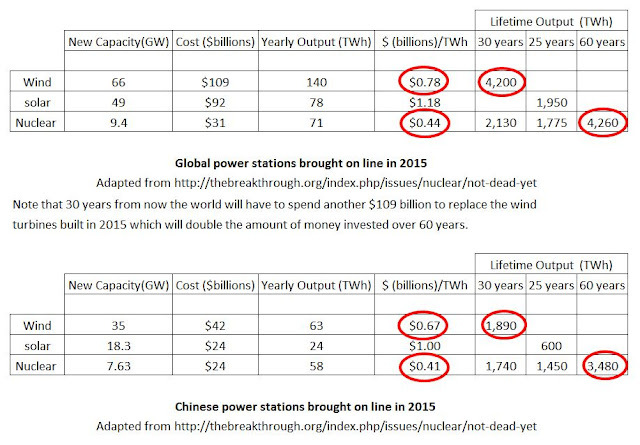 Read David Roberts Thinks "Solar is Winning"--Still Antinuclear. Most models do not, and cannot, model emerging solutions or current costs. That is even more true for 100% renewable energy studies than it is for studies that don’t exclude expansion of nuclear, a proven energy source. Models today cannot capture the effects of technologies and techniques that have not yet been developed. And this is especially true for new nuclear technologies. ...claims the guy with no background in engineering or science who blogged for an environmental website for over a decade. But this stuff is the subject of intense research, experimentation, and innovation right now. Actually, this is especially true for new nuclear technologies which are going gangbusters with new research and deployment of new projects. Wind and solar are pretty much mature designs relying at this point on continued cost reductions from economy of scale, which will eventually end as happened for other appliances like your water heater and refrigerator. Did he just call Jacobson’s 100% renewables plan based on an intercontinental DC super grid irresponsible? Did he just suggest that all of the plans with CCS are irresponsible? What did he just say? …but at the same time, it’s a safe bet that the energy world will see dramatic changes in the next few decades. Far more balancing options will be available to future modelers. It’s an even safer bet that nuclear will end up being the single largest low carbon source of energy as it is shown to be in most studies seeking lowest cost solutions as opposed to the 100% renewables studies that simply exclude it (see Figure 1). Dave is suggesting that models are all using exaggerated costs for wind and solar but it swings both ways. Natural gas and oil prices may go down even further, and if your nuclear is being built by the likes of KEPCO, costs will be reduced by a third to half. Dave appears to be unaware that the Jenkins literature review only covered studies done since 2014, just a few years ago. The professional energy community used to be quite convinced that wind and solar could play no serious role in the power system because of their variability. That’s what we call a straw man argument. What constitutes serious? The roughly 5% of electricity we get from wind today or the roughly 1% from solar? Then, for a long time, conventional wisdom was that they could provide no more than 20 percent of power before the grid started falling apart. He failed to say so, but he's talking about wind and solar again. They were right then and are right now. Certainly, Germany does not get 20% of its energy from wind and solar and it is very busy rebuilding its grid (see Figure 6). Now CW has it around 60 percent. It does? Says who? I’m guessing that CW stands for conventional wisdom. What constitutes conventional wisdom and why is renewable energy conventional wisdom right, but existing power grid conventional wisdom wrong? Figure 1 has the combination of wind and solar at about 20 percent. By conventional wisdom he means theoretical results from biased studies that exclude the expansion of nuclear to find minimal costs. And where’s the physical proof of 60 percent viability? Which direction do you suppose it will go in the next few decades? Well, since you asked, I’d say odds are that grids in 2050 will look very similar to grids today, unfortunately. The next most likely scenarios might be significantly more nuclear, wind, and solar. The least probable will be 80-100% renewables. Even Mark Jacobson has abandoned the idea that batteries can be used to balance wind and solar in his 100% scenario. They will make a small contribution to brief peak power requirements. I’ve been driving an electric car since 2011. There is no way electric car owners are going to let utilities wear out their batteries to balance the grid. Because distributed energy technologies are smaller than big power plants, they iterate faster. Whoa …suddenly Dave has leaped from a discussion of renewable energy technologies to distributed energy. Not the same thing. This certainly is not the first time he's done that. I assumed he would stop once I wrote an article explaining this to him. Is it possible he didn't read that article? Would he benefit from a comment field? A gasoline powered generator from Home Depot is a form of distributed energy. Large wind farms, solar farms, hydro dams, and biomass baseload power stations are not distributed energy. A distributed energy source is one located very close to the source that consumes its output, like solar panels on your roof. Rooftop solar is smaller, and also much more expensive than nuclear, but I have no idea what he’s talking about regards fast iteration. Naysayers predicted it would not be easy to install our measly 5% and 1% wind and solar respectively? Let’s chalk that up as another straw man. It certainly hasn’t been easier than naysayers predicted for Germany. We have a solid understanding of how to push VRE up to around 60 percent of grid power. Not true. When it comes to wind and solar, we have hypothesis from studies. When it comes to nuclear, we have France at about 70% nuclear. Until then, none of these potential future limitations are any reason to let up on the push for VRE. Not true. We could end up bankrupting ourselves trying to decarbonize. The 2017 joint study by the IEA and IRENA commissioned by the German government found that it would cost a full third more to hold nuclear constant rather than expand it. Obviously those plants are not going to stay open forever, and the ones that are genuinely unsafe should be shut down. Above, he throws the same bone to nuclear that he’s been throwing to it for the last decade, stopping short of calling for closure of existing stations and stopping well short of calling for new construction. Anyone out there who thinks Roberts has come around on nuclear energy since he started blogging for Grist magazine way back in 2004 now knows better. He hasn't learned a thing. And apparently Dave still clings to the old-school antinuclear belief that the evil nuclear regulatory agency would allow an unsafe nuclear power station to continue operating. That crosses the line into pure (somebody pick a word for me). Huh, maybe Clack should have said that to the NREL before they released their four-volume study showing a 150% increase in dispatchable biomass, hydro, and geothermal to get to 80% electricity in the U.S. instead of simply letting the amount of nuclear increase. See Figure 2. Keep them open …forever? Just could not bring himself to say “build more nuclear” to replace aging ones. Ah, the double speak. Should we, or shouldn’t we deploy more nuclear power? And again, he separates the technologically and economically proven war horse that is nuclear from other low carbon sources and lumps it in with the CCS canard. Ah, not quite, Dave. KEPCO is building nuclear in the UAE that is highly cost competitive, which is why it was favored in a market battle with renewables, as well as in Korea where it is the cheapest source they have. And why no mention of China (see Figure 7)? Also, when David refers to costs, whether he knows it or not, he is referring to LCOE values (levelized cost of energy) for a given power source, not system costs. But LCOE can only be compared on an apples-to-apples basis. Wind and solar LCOE can be used to pick between wind and solar in a given grid because they are both intermittent sources. You can’t compare the LCOE of an intermittent source with, say, a peaking power plant because, duh, wind and solar can’t do peaking power, and the same goes whenever you see a self-proclaimed expert comparing wind and solar LCOEs with baseload, and load following power sources. It’s the system cost that counts. Comparing the LCOE of apples to oranges is a sign that you don’t really know what you’re talking about. Germany is paying a very heavy price trying to incorporate low LCOE intermittents into its grid system. Above we have Dave continuing to subtly denigrate nuclear. 80-100% renewable grids are not perpetually on the horizon? Although there is always room for improvement, the world does not need radically different nuclear power designs anymore than we need radically different airliner designs. They are both more than adequate, both the safest at what they do. I’ve mentioned Dave’s expertise with double speak in other articles. He will suggest that we should not deploy more nuclear without actually ever saying so in one breath (keep existing nuclear open forever while acknowledging that this isn't possible), then tell you to deploy everything in another. You can’t see it when you read an article but it pops out when you parse it line by line as I tend to do. His articles are riddled with it. Above all, the haziness of the long-term view argues for humility on all sides. …except for David's treatment of nuclear energy? There’s much we do not yet know and cannot possibly anticipate, so it’s probably best for everyone to keep an open mind, support a range of bet-hedging experiments and initiatives, and maintain a healthy allergy to dogma. It should be clear to anyone who read my article that Dave does not have an open mind about today’s nuclear energy technology. He is an antinuclear activist in sheep’s clothing …the worst kind. And just maybe he should take a little bit of his own advice when it comes to disseminating renewable energy and antinuclear dogma.